Louis Bourgeois Spiders in front of the GE Building in July of 2001. Turbo and Ferryman, two works by internationally acclaimed British artist Tony Cragg in July of 2001. 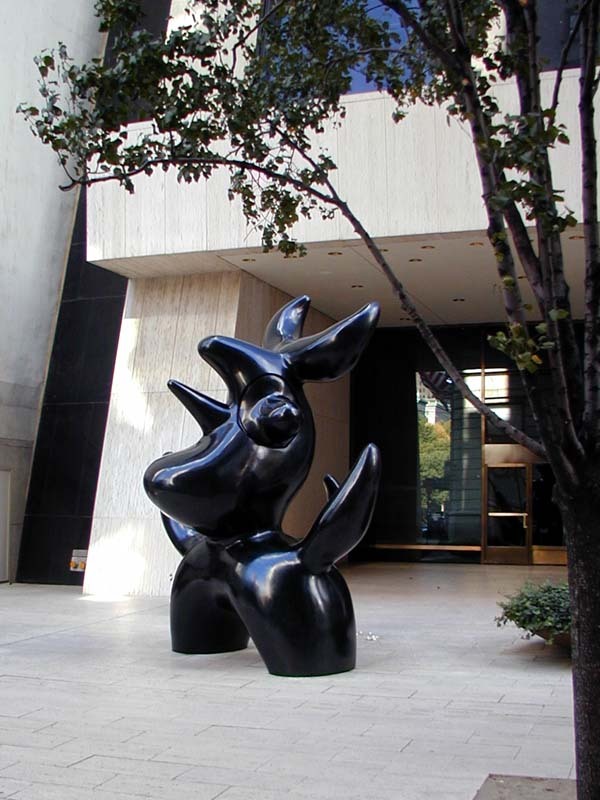 Joan Miro's "Moonbird" sculpture (1966) on 58th Street plaza of the Solow building. Very cool stuff. *I like seeing art displayed on city streets. *Perfect setting. Here is another recent installation. Stainless steel and resin painted with acrylic urethane. Sculpture inside the glass atrium of *IBM building in January of 2002. The typewrite eraser and the spiders are really dramatic. Wave UFO in the glass atrium of the*IBM building. New York, New York - Beginning May 10, the glass atrium of 590 Madison Avenue will take on an otherworldly atmosphere when the Public Art Fund presents Mariko Mori's Wave UFO, a stunning sculptural object and viewer participatory installation which epitomizes Mori's ongoing exploration of the relationship between the individual and an interconnected cosmos. This ambitious presentation of Wave UFO in New York is made possible by Bloomberg. Wave UFO - an all-encompassing project that comes after three years of research - fuses real-time computer graphics, brainwave technology, sound, and state-of-the-art architectural engineering to create a dynamic interactive experience. The connection between technology and spirituality, increasingly important in Mori's work, is effected here through the use of specially designed computer programs and scientific equipment that monitor and visually interpret the participants' brainwaves. Drawing upon the Buddhist principle that all forms of life in the universe are interconnected, Wave UFO seamlessly unites actual individual physical experience with Mori's singular vision of a cosmic dream world. Within the tranquil interior of the work, Mori sends participants, three at a time, on an aesthetic voyage that seeks to connect three individuals to each other and to the world at large. From the outside, Wave UFO is an immense shimmering sculpture, shaped like a drop of water and appearing to hover a few feet above the ground. It measures 34 feet long x 17 feet wide x 14 feet tall. This fiberglass shell houses an interior capsule, which viewers enter via a series of resin lily pad shaped steps. Inside Wave UFO, three viewers at a time recline on a Technogel chair - a spongy, comfortable surface - to watch a 7-minute projection on the domed ceiling above. Wave UFO: Real Time Brain Wave and "Connected World"
The video projection that takes place inside consists of two parts, which flow seamlessly together. Each viewer is outfitted with a set of electrodes, which gather brainwave data. This information is instantly transformed into visual imagery, in real-time correspondence with the actual activity of the brain, and projected onto the screen: Six undulating bio-amorphous cells represent the left and right lobes of each of the three participants' brains, and a waving line moves in correspondence with blinks and other facial movements. This instant biofeedback thus incorporates the experience of watching the projection, and the interaction between the three viewers. The forms change shape and color in response to three types of brainwaves, showing which type is most dominant. Alpha (blue) waves indicate wakeful relaxation, Beta (pink) waves indicate alertness or agitation, and Theta (yellow) waves indicate a dreamlike state. When the two cells come together, that demonstrates "coherence" between the two lobes of the brain. Mental functions such as thinking in other languages or doing math problems immediately transform the characteristics of the graphics. The second part of the projection, "Connected World," links the individual experience to the universal through a graphic animation sequence, based on a series of paintings made by Mori. Colorful abstract forms slowly expand and evolve into shapes like single cells and molecular structures, creating a dream world that is at once primordial and ethereal. With this sequence, Mori brings the viewer from the live biofeedback stage into what she describes as "a deeper consciousness in which the self and the universe become interconnected." With Wave UFO, her most technically ambitious project to date, Mariko Mori adds to an accomplished body of recent work that has revolved around the universal themes of spiritual journey, beauty, emptiness, and enlightenment. In 1999 she created the Dream Temple, a high-tech installation based upon the ancient Buddhist Yumedono Temple in Nara, Japan (739 A.D.), a work that could be experienced by only one person at a time. Mori first became known in the 1990s for her engaging, highly stylized photographic and multimedia works that blended animation and pop culture with Japanese ritual and cultural tradition. These works - which often starred Mori herself as shaman, cyber-chic girl, goddess, or another mythical character- were typically set in otherworldly landscapes and made using up-to-the-minute technologies. Mariko Mori's Wave UFO in the atrium of 590 Madison Avenue (at 56th Street) will be on view May 10 - July 31, 2003. Hours are Tuesday 10am - 8pm; Wednesday - Saturday 11am - 7pm; and Sunday 11am - 5pm. This exhibition is free. A special press preview will be held on Friday, May 9 from 11am - 5pm; please call the Public Art Fund for reservations at 212-980-4575. This exhibition of Mariko Mori's Wave UFO is sponsored by Bloomberg. Additional support was provided by Melissa and Robert Soros. Special thanks to Edward J. Minskoff Equities, Kunsthaus Bregenz, Deitch Projects, and Marco Della Torre. Additional project support provided by Shiseido Co., LTD, Technogel, Lechler, and Zumtobel Staff, The Light. Mariko Mori, born in Tokyo, was educated at the Chelsea College of Art, London (1989-92) and participated in the Whitney Museum of American Art Independent Study Program. She has had recent solo exhibitions and installations at Kunsthaus Bregenz, Austria; Museum of Contemporary Art, Tokyo; Centre Georges Ponpidou, Paris; Prada Foundation, Milan; The Brooklyn Museum of Art, New York; Museum of Contemporary Art, Chicago, The Serpentine Gallery, London; Los Angeles County Museum of Art; and Deitch Projects, New York. The Public Art Fund is New York's leading presenter of artists' projects, new commissions, installations and exhibitions in public spaces. With twenty-five years of experience and an international reputation, the Public Art Fund identifies, coordinates, and realizes a diversity of major projects by both established and emerging artists throughout New York City. By bringing artworks outside the traditional context of museums and galleries, the Public Art Fund provides a unique platform for an unparalleled public encounter with the art of our time. The Public Art Fund is a non-profit arts organization supported by generous gifts from individuals, foundations, and corporations, and with public funds from The New York State Council on the Arts, a State Agency, and the New York City Department of Cultural Affairs. IT is summer, when some of us will look for any flimsy excuse to be outside. There are people who can sit on a stoop, point their chins toward the sun and call it a day. I admire them. But there are also those of us, guilt-ridden, who need to feel we are going somewhere or doing something. The city, accommodating of most relatively harmless psychological maladies, fortunately satisfies a neurotic's needs with endless options, some frivolous, others less so. A virtual industry of artists and arts organizations springs into action when the weather turns sultry. They are almost a community unto themselves. They move to the roofs and courtyards of museums. They take over leafy patches of city parks and try to spruce up concrete plazas. They have their spots where devotees know to congregate. Lately they have also been venturing onto the Astrovision screen in Times Square, competing for attention with the underwear billboards by providing a minute's artistic stimulation each hour, a noble lost cause. It seems grumpy and possibly beside the point to say that on the whole outdoor art is bad. So I won't mention it. Let me stress instead that this year, as in most years, some of it turns out to be fine or even very fine. You can manage to kill a sunny summer morning and afternoon happily outside looking at art and in the process feel virtuous for being so productive. I did it. Here are some highlights of my day. It began with peering into a pit. I don't know about you, but having been to the Whitney Museum innumerable times, I can still count on two hands how often I have ventured into the museum's dour sculpture court, below street level along Madison Avenue. Occasionally I have seen curious passers-by furtively glance down from the sidewalk wondering what may have fallen there. The court functions as a light well for the museum's restaurant. Otherwise it doesn't function at all. During the cold war, when teachers trained schoolchildren to duck and cover under their desks and nervous suburbanites built bomb shelters in their backyards, architects came up with the idea that museums should put galleries, courtyards and sculpture gardens in what used to be the basement. Needing more room and congenitally reluctant to say no to architects, museums went along with the idea. Anyone who has been in even the most commodious underground gallery knows what happened. The Museum of Modern Art's former underground galleries were as spacious as any of the rooms upstairs, but they felt oppressive and low. People instinctively realize where they are in relation to street level, and everyone senses that it is unnatural to be below ground unless you are dead. But what do you know, the Whitney's courtyard has been temporarily salvaged by Sarah Sze, a modern master of bric-a-brac. The large sculpture she has installed is a kind of makeshift geological dig, cleverly exploiting its subterranean locale. From the street you peer down on an archipelago of blue plastic islands dotted with toy mountains and bottles of window cleaner. From the court looking up, you gaze more clearly at seven strata of miniature grassy platforms, aquariums and junk connected by an elaborate Rube Goldbergian armature of pipes. Water pours and burbles from a few of the pipes. Mostly the pipes are just for show. Cement and gravel "rock puddles" (also just for show) pretend to support the pipes, meanwhile alluding offhandedly to Japanese gardens and Robert Smithson's "Spiral Jetty." The work's title, "The Triple Point of Water," refers to a combination of temperature and pressure at which water can simultaneously be gas, liquid and solid. This may have something to do with the snowy mountains and the burbling water. All of that hardly matters. The work is simply a hoot. It took an army of five people three weeks to build, using 33 small aquariums, some of them filled like mini-dioramas with Styrofoam animal skeletons; 60 square feet of fake grass; 7 bottles of Windex; 7 fans; 60 empty plastic water bottles; 2 bottles of honey; 300 toy mountain peaks; 5 earplugs; 3 empty containers of cream; 500 feet of orange string; 3 credit cards and 1 feather. Debra Singer, the curator, told me that a single bird occasionally roosts in a grassy nook. Roy Lichtenstein's sculptures are on the Met's roof this summer. To tell you the truth, I have never found them as compelling as his paintings, but up there they look as good as they ever have. They stand cheerfully against the skyline. The colors are mostly primaries, as usual. Picked out by the August sun, they gleam like flags. The effect is heraldic. The tallest are like painted metal pillars, the height of flagpoles, suggesting blowsy women. Lichtenstein loved wry jokes. Here the humor, aside from the obvious point of evoking flesh with metal, entails riffing dryly on Picasso, de Kooning, Pollock and other modern art heavies whom Lichtenstein admired. 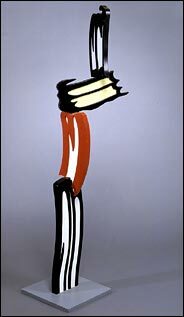 A sculpture of a brush stroke becomes the flowing hair of a de Kooning-like woman attached to "Girl Before a Mirror," Picasso's famously ripe, intricately patterned painted homage to his blond lover Marie-Thérèse Walther, which Lichtenstein adapts to sculpture. Lichtenstein was also fascinated by how artists over many centuries represented shadows and planes of color, from medieval stained-glass artists and tapestry designers to comic book illustrators using Benday dots. This was the funny thing about Lichtenstein: everyone took him to be a jokey Pop artist slumming in cartoon characters, but he immersed himself in the conventions of art history and visual perception and didn't care particularly about popular culture. The showstopper on the Met roof is his big sculpture, almost like a folded origami, imitating a child's drawing of a house, with a triangle for the roof and rectangles for the walls, squares cut into the rectangles for windows, through which you now see the tops of apartment buildings and office towers. The sculpture is one of those perceptual tricks: it seems to recede when looked at from either front or back. Nan Rosenthal, the show's curator, has installed it on a grassy podium, like a little mowed patch of suburbia, which hides the supporting steel beams. The problem outdoor sculptors in New York City must overcome is New York City. Wherever you are, there is almost always something to look at. Central Park is one of the world's great works of public art. Rarely do you feel a pressing need for a sculptor to come and liven up the view. (Christo and Jeanne-Claude are promising to do so.) Nor do many New Yorkers have so much free time that they will linger before a sculpture if it does not grab them by the lapels and compel them to stop. Theatricality is therefore a virtue for outdoor sculpture in the city. Show me, we challenge an artist. Meandering south from the Met, I landed at Doris C. Freedman Plaza, where Wim Delvoye has answered that challenge admirably. His sculptures there, at the southeast corner of Central Park, and in Madison Square Park are Gothic versions of modern machines and building equipment. Call it Gothic Revival revised. Mr. Delvoye is a provocateur. You may recall that he devised a machine for producing excrement that made tabloid headlines not long ago. His strategy is subtler this time and more entertaining. On the plaza he has put "Caterpillar," a full-size sculpture of an excavator, its backhoe forming an arch at the entrance to the park. The material is Cor-Ten steel perforated with medieval filigree and coats of arms: fleurs-de-lis, lions and eagles, spires and columns. Imagine a metal doily nearly the size of a log cabin, and you roughly get both the scale and the mixed signals. The work looks simultaneously heavy, lumbering, intricate and airy. At the south end of Madison Square Park, near 23rd Street, are his cement mixer (evoking the choir of a church), a wheelbarrow, traffic cones, a shovel, a pile of sand, barricades and another excavator, which vaguely resembles Notre Dame in Paris. All steel, all differently filigreed. Mr. Delvoye, a Belgian, once painted gas canisters with blue Delft windmills and hired Indonesian woodcarvers to make a baroque-ornamented cement truck out of teak. He coined the word "glocal" for his blends of Old World motifs and modern industrial subjects. Now he's poking fun, I assume, at Richard Serra and other American sculptors who use steel and heavy equipment, with religion as the ironic subtext for modernism's spiritual undercurrents. He's also alluding to the city itself, and the familiar metaphor of skyscrapers as today's Gothic cathedrals. The best compliment a jaded New Yorker can give him is to say that after a stroll through glorious Central Park, his excavator is not a letdown. I neglected to mention a stop after Central Park and before Madison Square Park, in Times Square, where Jeremy Blake is the latest artist to participate in "The 59th Minute: Video Art on the Times Square Astrovision," a joint project of Creative Time and Panasonic. His work is called "Cowboy Waltz" and was inspired, I gather, by a haunted house in California. It consists of three one-minute videos. As for appearing on the 59th minute, incidentally, that turns out to be either wishful thinking or an approximation. Within sight of the screen are half a dozen digital clocks disagreeing about the time. My watch said 12:56 when one episode of Mr. Blake's work suddenly appeared: florid ink drawings, abstract patterns and woozy designs in saturated colors, like Rorschach blots morphing into a final blaze of light. Some people, accustomed to advertisements and the subtitled sight of Katie Couric, may have thought the screen's computer had contracted a virus. Mr. Blake is clearly hoping to insinuate his art into the sensory consciousness of the crowds passing through Times Square, if only subliminally. To an art critic, young artists' fascination with 1960's psychedelia came to mind. So did a work by Robert Gober from the 1980's, now at the Venice Biennale: a film of a painting changing. Mr. Blake, who describes his works as moving paintings, would no doubt describe himself as a painter using digital equipment. He introduces the elements of time and narrative — abstract narrative — into the medium of painting, sacrificing the aura of the one-of-a-kind handmade object. I also prefer to think of him this way. Digital art still conjures up projects primarily about technology. Mr. Blake's work is more aesthetically arresting than most digital art. Whether passing tourists will register it on their way to Toys "R" Us or MTV doesn't really matter in the end. There are limits beyond which even the most theatrical outdoor artist can't be expected to go. To coincide with "Cowboy Waltz," several of Mr. Blake's videos are being shown at the American Museum of the Moving Image in Queens, where there is no guitarist singing in his underwear or toy store with a life-size model of a Tyrannosaurus rex vying for attention. Next, City Hall Park, lunch time, the benches full of smooching lovers and office workers picking at salads from plastic take-out containers. Passing families of out-of-towners identified themselves by grappling with folded city maps on the way to ground zero or Century 21. Not too many people seemed to register the sculptures discreetly tucked into the greenery. It even took me a minute to spot Walter Martin and Paloma Munoz's "9 to 5" (1996): elegant bronze faucets strapped to trees with bronze pears appearing to drip into bronze buckets. Nearby, less inconspicuous but still little noticed by the lunch crowd, Peter Rostovsky's "Monument" is an improbably steep and craggy mountain peak, about the height of a basketball hoop. On top of it stands a small man wearing a business suit. Unless he is Clark Kent, he is not going to get down from up there. I take that to be the comic message of the work, from 2000, but I also wonder whether it was selected for this site because it can bring to mind the people who died in the twin towers, or conversely, whether it was chosen despite that unpleasant association. More conspicuous, "Witch Catcher" (1997) is Brian Tolle's sculpture of a chimney that twists into a spiral at the top. Mr. Tolle designed the Irish famine monument a few blocks away. He grasps the mordancy of ruins and memorials. I remember as a boy seeing a house burn down in the country. Only the chimney remained. "Witch Catcher," notwithstanding its surreal punch line, reminded me of that house poetically. From City Hall Park, which is to say Lower Manhattan, you can ride the Staten Island Ferry to see 86 manhole covers decorated with herons, ospreys and other local bird and plant life and trimmed with sea creatures. Elizabeth Turk designed them for a residential stretch of Seguine Avenue at the southern end of the island as part of the city's Percent for Art program. Alternatively, you can head to Brooklyn. I won't linger over my own foray to Brooklyn and then Queens. For serious followers of outdoor sculpture who must see everything each summer, all these stops are obligatory. For everyone else, they are not. In brief, the plaza at Long Island University's Brooklyn campus on Flatbush Avenue, as usual, has a sculpture show. Peter Lundberg has concocted something resembling a huge Möbius strip made of cement and steel. In adjacent window bays of the university's humanities building, Lisa Mordhorst has hung slender panels with photographs of desert landscapes. The effect is slightly arresting and grimly decorative. Jesse Bercowetz and Matt Bua have built a shack from junk: the intention seems to be to cross Red Grooms with Thomas Hirshhorn, to give it the kindest interpretation. Suffice it to say that nothing here redeems this forlorn plaza and some of it makes the situation slightly worse. Next to the Brooklyn Bridge, in Empire-Fulton Ferry State Park, the Brooklyn Waterfront Artists Coalition is presenting its 21st annual outdoor sculpture show. The park is a scruffy green stretch along the water with spectacular views. Not enough of the 31 artists make good use of the extraordinary location. Several roughly carved wood beams by Matthew Weber, evoking Donald Judd and Magdalena Abakanowicz, are plunked down as if arbitrarily. Anna Golici has made an uncomfortable bench from a tree, facing not the water but Nicolae Golici's grim one-liner: a small house wrapped in plastic and duct tape. A few works allude not very subtly to the attack on the World Trade Center, which used to be what you saw across the bridge. Kasra Paydavousi has made an oversize wood sculpture of a praying man; Miggy Buck's sculpture consists of a crucifix dancing with a crescent and a Jewish star. On a sunny day at least the sight of waves crashing against the rocky embankment and tugboats lugging barges down the river partly compensated for what the show lacked in visual punch. Finally I stopped into Socrates Sculpture Park in Long Island City, a mecca for outdoor sculpture mavens. The annual summer show was ending its run, and a few other people had also come to see it or maybe they were just looking for a place to be outside. A woman lazily tossed a tennis ball to her dog. A couple of teenagers snuggled along the East River. A little girl played in a sandbox that had a circular "No Children Allowed" diagram on it, which was part of one of the artworks. "Penumbra" by Jean Shin, which will still be around this weekend, provided the best shade, as the title promises. Strung between trees, it is a canopy of broken brown, blue, red and black umbrellas that Ms. Shin found on the street. A man was standing in the dappled light under it, and it took a few seconds for me to make out what he was doing. He held a fishing line with a live eel writhing on the end. Did he catch the eel in the river? His young daughter was alternately laughing and screaming. His wife looked on impassively, as if she had seen this many times. He pulled a switchblade from his pocket, noticed me, smiled nervously, seized the eel and sliced it in two. I mention this because art is not always what's most memorable when you are wandering around New York on a hot summer afternoon. 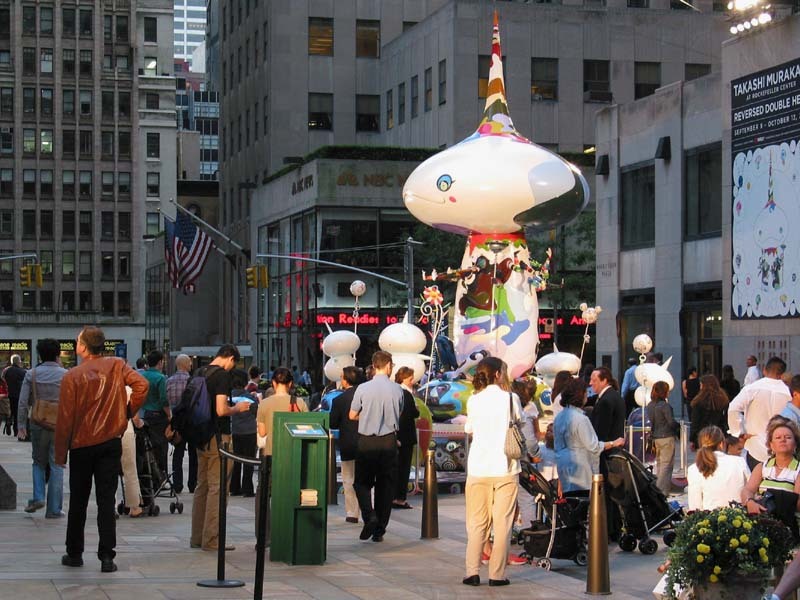 "Tongari-kun" (Japanese for "Mr. Pointy"), a 30-foot-tall Buddha-like figure with multiple arms and a pointed head -- Takashi Murakami's largest sculpture ever -- presiding over the scene at Rockefeller Center. Surveying this scene are two gigantic "eyeball" balloons, each 30 feet in diameter, floating 60 feet in the air above the Rockefeller Center Ice Rink. NEW YORK, May 27, 2003 - This fall, New York City's most famous plaza will be transformed into a fantastical pop cityscape. Takashi Murakami at Rockefeller Center: Reversed Double Helix, a major outdoor art exhibition organized by the Public Art Fund on behalf of Tishman Speyer Properties and presented by Target Stores, will open on September 9, 2003 and run through October 12. This all-encompassing installation-Murakami's most ambitious U.S. solo show to date-will feature all new work including a large freestanding sculpture, two giant floating balloons, and a forest of mushroom seating. A 30-foot-tall Buddha-like figure with multiple arms and a pointed head-the artist's largest sculpture ever-will preside over the scene in 30 Rockefeller Plaza. "Tongari-kun" (Japanese for "Mr. Pointy") as he is known in Murakami's universe of characters, will be flanked by four smaller figures. Low-lying mushrooms, a familiar motif in Murakami's artwork, will surround the central sculpture and serve as seating areas for visitors. Surveying this scene will be two gigantic "eyeball" balloons, each 30 feet in diameter, floating 60 feet in the air above the Rockefeller Center Ice Rink. 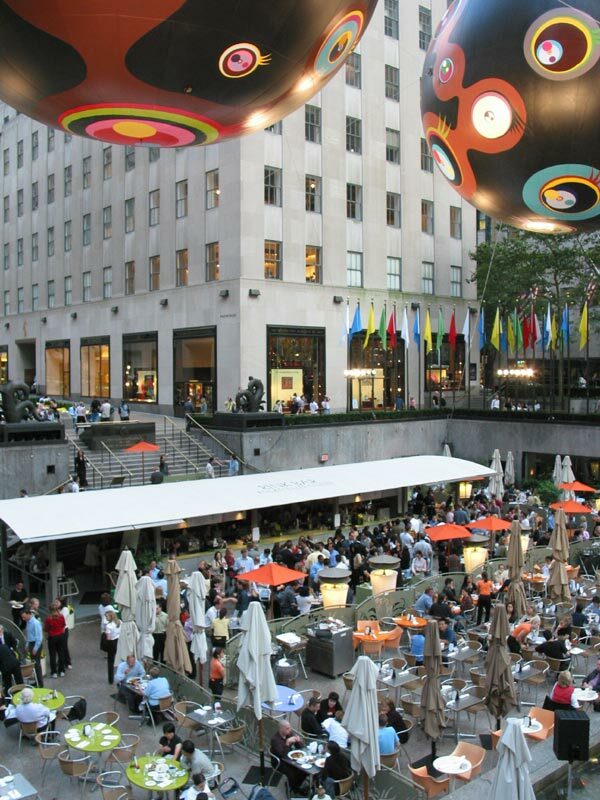 Murakami will also design the flags surrounding Rockefeller Center to complete the dazzling aesthetic transformation. The exhibition subtitle, "Reversed Double Helix," refers to the twisted spirals of DNA strands and plays upon Murakami's universe of mutant cartoon characters, where wide-eyed mushrooms coexist with multi-armed giants, happy flowers, and elfin creatures. Characterized by horizontality, bright acrylic patterns and flat unblemished surfaces, Murakami's works are an inspired mix of tradition and modernity, as Japanese Nihon-ga paintings of the 19th century meld with pop culture influences like Andy Warhol's Factory and Walt Disney animation. With its formal sophistication and ever-gleeful cast of characters, Murakami's art appeals on a purely visual level even as it references religion, subcultures, and art history. In addition to his work as an artist, Takashi Murakami is a curator, entrepreneur and a student of contemporary Japanese society and its efforts to define itself in a post-war era. His interdisciplinary approach to art production culls from the current popularity of otaku-animated films (anime), comics (manga), music and fashions inspired by Japanese youth culture. In 2000, Murakami curated an exhibition of Japanese art titled Superflat, which acknowledged a movement toward mass produced entertainment and its effects on contemporary aesthetics. Murakami is also internationally recognized for his recent collaboration with designer Marc Jacobs to create handbags and other products for the Louis Vuitton fashion house. Takashi Murakami was born in Tokyo and received his BFA, MFA and PhD from the Tokyo National University of Fine Arts and Music. He has had recent solo shows at Marianne Boesky, New York (2003); Fondation Cartier pour l'art contemporain, Paris (2002); Museum of Contemporary Art, Tokyo (2001); Museum of Fine Arts, Boston (2001); and Galerie Emmanuel Perrotin, Paris (2001). projects by both established and emerging artists throughout New York City. By bringing artworks outside the traditional context of museums and galleries, the Public Art Fund provides a unique platform for an unparalleled public encounter with the art of our time. Tishman Speyer Properties is the co-owner and manager of Rockefeller Center, which is the site of numerous public exhibits and events, including the New York International Orchid Show and the upcoming Centennial of Flight exhibit that will take place July 29 - August 18, 2003. The annual art installation at Rockefeller Center is consistent with Tishman Speyer's commitment to bringing world-class art to the public in its more than 40 buildings around the globe. Tishman Speyer has earned a worldwide reputation for innovative utilization of public art in its signature commercial properties, which include Rockefeller Center and The Chrysler Center in New York City, and the Sony Center in Berlin. Rockefeller Center and Public Art Fund have presented other major works of art to the millions of people who visit and work at this New York landmark. Last summer, Nam June Paik's Transmission broadcast a nightly laser display around the plaza. 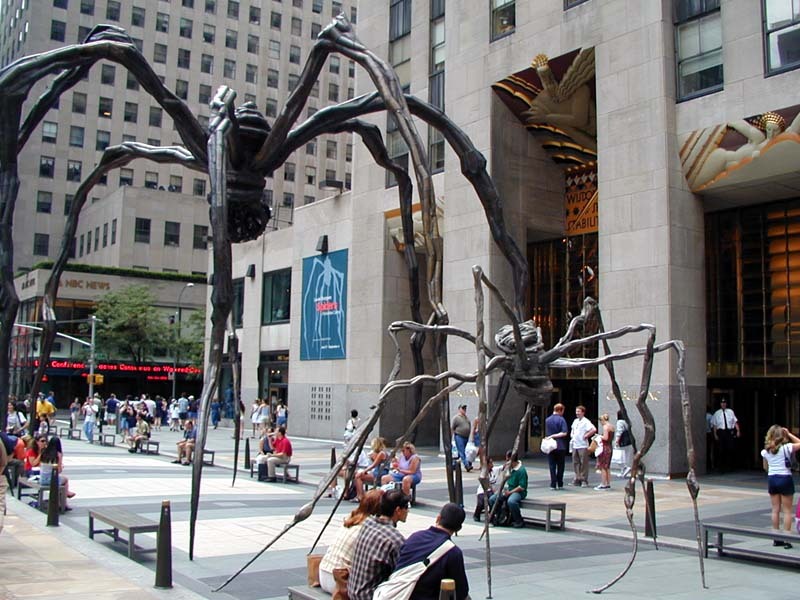 In 2000, Jeff Koons' monumental topiary Puppy blossomed at the foot of 30 Rockefeller Plaza, and the following year, Louise Bourgeois presented three massive bronze spiders, including the thirty-foot-tall Maman. In 1998 eight Auguste Rodin bronzes from the Collection of Iris and B. Gerald Cantor were exhibited in the Channel Gardens. Each day an estimated 250,000 people walk through the Rockefeller Plaza complex, which is home to the most famous Christmas Tree in the world. Minneapolis-based Target Stores serves guests at 1,167 stores in 47 states nationwide, including 13 stores in the New York metropolitan area, by delivering today's best retail trends at affordable prices. Whether visiting a Target store or shopping online at target.com, guests enjoy a fun and convenient shopping experience with access to thousands of unique and highly differentiated items. Target Stores, along with its parent company Target Corporation (NYSE:TGT), gives back more than $2 million a week to its local communities through grants and special programs. Since opening its first store in 1962, Target has partnered with nonprofit organizations, guests and team members to help meet community needs. Maquettes for Lichtenstein's "Woman: Sunlight, Moonlight." This weekend a team of five riggers will begin assembling a 50-foot-tall fiberglass sculpture of four colorful brushstrokes in the octagonal rotunda of the former Tweed Courthouse, renamed City Hall Academy as the New York City Education Department's new headquarters. "Element E," created by the Pop Art master Roy Lichtenstein 13 years before his death in 1997, captures the moment when a thick paint brush is drawn across a canvas. The sculpture is one of four Lichtensteins being installed this weekend in Lower Manhattan. Others will be in City Hall Park and in the lobby of City Hall. The installation has been organized by the Public Art Fund, a nonprofit institution that presents art around the city, and is being financed by the Lichtenstein estate and by Forest City Ratner Companies, the real estate developer. But the idea to put art, specifically Lichtenstein — a born and bred New Yorker — in Lower Manhattan reflects the influence of Mayor Michael R. Bloomberg. Since Mr. Bloomberg took office almost two years ago, his support of the arts has been visible in ways big and small. In January he asked the Public Art Fund to organize a temporary exhibition of outdoor artwork in City Hall Park. (Much of City Hall Park was closed to the public for 10 years, for both renovations and security concerns during the Giuliani administration, and no art was on view there.) The mayor also gave his blessing for the artists Christo and Jeanne-Claude to festoon 23 miles of Central Park's walkways with billowing saffron-colored fabric in February 2005. Moreover, every invitation from the mayor's office shows a work of art from the city's collection. Even the Green Book, the city's official directory, has begun to display an artwork on its cover. The first, for the 2002-3 edition, showed Keith Haring's version of the Statue of Liberty. The latest, the 2003-4 Green Book, features "I Love Liberty," a 1982 Pop image by Lichtenstein. "The mayor definitely cares about art and about making people see the world in different ways," said Patricia E. Harris, the deputy mayor for administration. 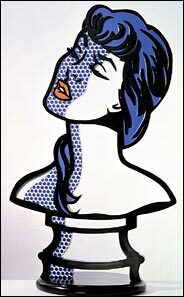 "He had seen Lichtenstein's `Brushstroke' in front of the Seagram Building," she added. "And when we were standing in the atrium of the City Hall Academy, he thought it would be great to install a Lichtenstein there, especially now that the public is allowed to have tours of the building." The installation of "Element E" (1983-84) in City Hall Academy's 85-foot-tall rotunda will be the first time the sculpture will have been shown in its full-size version. The piece was originally commissioned for the sculpture gardens of the Stuart Collection at the La Jolla campus of the University of California, San Diego. Lichtenstein created a group of small-scale wood maquettes for what was intended as five different large, varied brushstroke sculptures near the student center. But financing for the fabrication and installation became a problem, and the sculptures were never made. "Element E" was the tallest of the five. When Dorothy Lichtenstein, the artist's widow, and Jack Cowart, director of the Roy Lichtenstein Foundation, heard that the mayor was interested in putting a sculpture in City Hall Academy, they decided to fabricate it in fiberglass rather than steel, as Lichtenstein had intended, because fiberglass is lighter, easier to install and easier to fabricate in sections. Since doorways and corridors of the Tweed building are narrow, the sculpture had to be made in four pieces and assembled on site. The work is three stories tall, and each brushstroke is a different color, ranging from deep red to black. 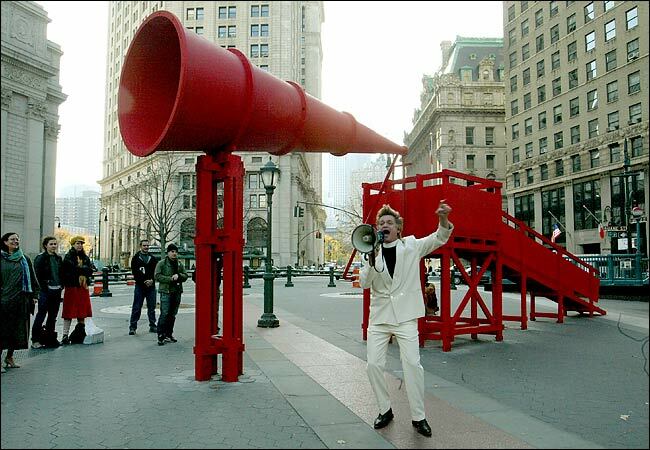 Once plans for "Element E" were under way, the Public Art Fund decided to expand the installation into City Hall Park. The Lichtensteins will be the second exhibition of art in City Hall Park during Mr. Bloomberg's term. The first, on view from January until last month and also organized by the Public Art Fund, was "MetroSpective," a selection of work by different artists originally displayed at the MetroTech Center in Brooklyn. Stephen Mazoh, a private art dealer from Rhinebeck, N.Y., lent Lichtenstein's "Brushstroke Group" (1986) to City Hall Park. 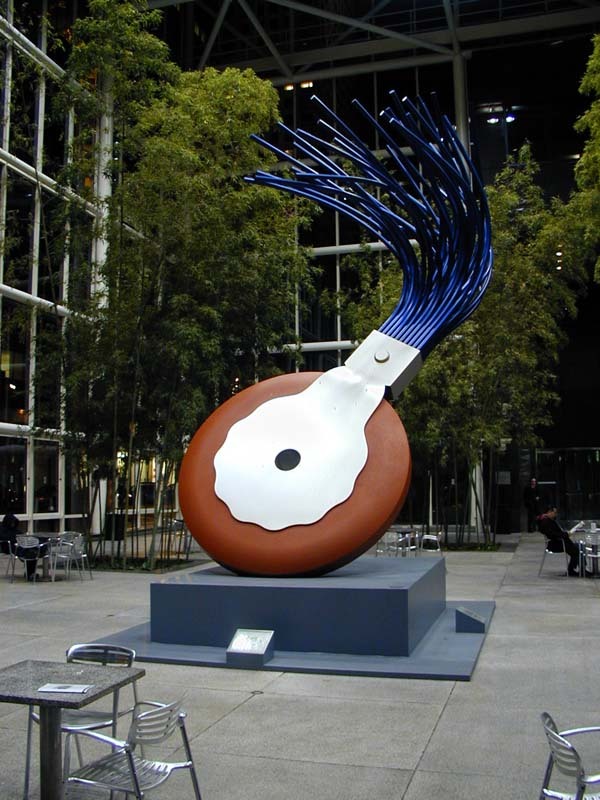 The piece has been on public view several places before, notably in the Lichtenstein retrospective at the Solomon R. Guggenheim Museum in 1993, when it stood outside the Frank Lloyd Wright building on Fifth Avenue. Also on view in City Hall Park is "Endless Drip" (1995), the artist's witty homage to Brancusi's "Endless Column." It is being lent by the artist's estate. A 1996 bronze sculpture, "Woman: Sunlight, Moonlight," has also been lent by the estate and is to go in the lobby of City Hall. It is a two-sided bronze bust. One side, showing a woman's face and flowing hair, is dark blue, as if lighted by moonlight, while on the other side her hair is yellow and her face flushed red, as if bathed in sunlight. "This project sends a message that the arts are alive in this city," said Susan Freedman, president of the Public Art Fund. "It's important to the morale of the art community." City Hall Academy and City Hall are generally closed to the public, but free guided tours of the buildings and works in the Lichtenstein exhibition will be given, by appointment, on selected Fridays at 2 p.m. Information: (212) 788-6865. Maquettes for Lichtenstein's "Element E." New York City is installing large versions of this and other works of his. The parts of the sculpture "Element E" are united in the rotunda of the Tweed Courthouse. The work arrived in four pieces. Cramming a 55-foot-tall sculpture into the Tweed Courthouse rotunda is not an easy job. In terms of sheer difficulty, the task probably lies somewhere between building a ship in a bottle and stuffing a Steinway up a stovepipe. But when the sculpture in question is one created by the Pop Art guru Roy Lichtenstein, cost $150,000 to build, and was basically commissioned at the behest of the mayor himself, there is a touch more pressure on the shoulders of the guys responsible for assembling the piece, which is why Jay Merrick was being very, very careful yesterday afternoon. "Steady it — side to side in the back," called out Mr. Merrick, the foreman of the crew charged with setting up the sculpture, "Element E."
The 5,500-pound sculpture of four swooping brush strokes made of fiberglass arrived at the courthouse, now the headquarters of the Department of Education, in four pieces. Getting them inside the building was the easy part. By the end of the day, those four hunks would be stacked one atop another, rising 55 feet through the courthouse's elegant Italianate rotunda. Well, assuming nothing crashed to the ground. Anyone who has ever lugged a couch up to a fifth-floor walk-up apartment could sympathize with Mr. Merrick and the crew from Mariano Brothers Inc., a rigging company, as they prepared to hoist the third piece into the air inside the rotunda yesterday afternoon. They were essentially working against the dimensions — trying to fit the pieces into a snug rotunda whose size had been shrunken by interior scaffolding and metal supports. "We're essentially slipping a 55-foot sculpture through your front door," said Richard Griggs, project director of the Public Art Fund, the nonprofit institution that organized the exhibition of four Lichtenstein works that are being shown in Lower Manhattan this fall. "It's a remarkable moving job." 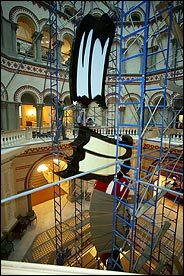 Two pieces of the black-and-red sculpture already stood vertically in the rotunda, still wrapped like mummies in blue tarps, duct tape and protective felt blankets. The outside of the sculpture is fiberglass, with an aluminum frame hidden inside, and the pieces connected through tubes that jutted from the bottom of one into the top of another. The first two pieces went up with only minor difficulty, but the third piece would be the trickiest, said Frank Mariano, one of five Marianos who were working on the job yesterday. The sculpture's third section is the only portion that sits horizontally, giving the crew far less room to hoist it into place without banging into something. Nudging that piece into place at the mouth of the rotunda, the crew unwrapped it and prepared to attach the cables and harnesses needed to haul it skyward. One man touched the piece and left greasy fingerprints on the black surface. "Look at that, man," Mr. Merrick clucked. "You just had fried chicken." Above him, three men climbed through a web of scaffolding and prepared the six-ton rig and chains that would lift the third piece. Suddenly, a knife dropped from the scaffolding and clattered against the marble floor. "Where'd it go?" one of the men yelled. The knife located, the job continued. With painstaking care, the crew lifted the third piece into the air, guiding it between the Scylla and Charybdis of scaffolding on one side and the rest of the sculpture on the other. At times, it swung like a giant uvula, and the crew yelled out, "Up! Up! Up!" or "Hold! Hold!" "It's a real nail-biter," said Natasha Sigmund, of the Lichtenstein Foundation, who had come to watch the assembly. "This is tight." When a work of Dadaist artist Marcel Duchamp was cracked during transport, Mr. Duchamp declared the damage part of the art, and would not allow repairs. The assembly crew yesterday was a bit more cautious, taking 90 minutes to lift the third piece 10 feet off the ground. "If this comes up and you scratch the work, it's pointless," said Peter Mariano, as he perched on the scaffolding. But there were no scratches and no crashes yesterday. All four pieces were lifted and lowered, and they fit. The sculpture is bolted to the ground, and barring any disasters, will stand at Tweed for the next year. But Tom Eccles, the director of the Public Art Fund, was already forming an exit strategy. "How the hell we're going to get it out of here is the question," he said. Tours will be given by appointment on selected Fridays at 2 p.m.? I guess I'll never see it then, too bad. I appreciate the effort by Bloomberg, but I wish these pieces of art were a little more public. Here's a new piece of street art on Prince Street.....nothing significant, but it's the thought that counts. 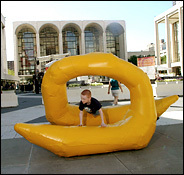 Franz West's aluminum sculptures at Lincoln Center meet his first requirement for art: they can be touched. RATHER too lumpy, way too candyland-colorfully dressed to be New York chic, seven recent arrivals at Lincoln Center disembarked from a flatbed truck instead of the typical tourist bus. And like many another group of visitors before them, they stood out immediately — but not at all uncomfortably — nearly vibrating with ingenuous energy on a brilliant summer morning. Franz West, the Viennese impresario who is responsible for these characters, likes to think of them as "fairy tale figures, maybe slaves and emperors," but without any specific story to tell or identifiable place of origin. "A narrative, but a narrative that you can't understand what it means," he says in heavily accented English. "If you put the figures together in a frieze, there's a story, but it's a nonsense story." Fittingly, the squat triangle these sculptures form conjures up a playful pediment for Lincoln Center's decidedly unplayful high-modern columned temples. To begin with, they are meant to be used; and at any time of day it is clear that their audience — which includes everyone passing by Josie Robertson Plaza — needs no invitation to violate the core rule of looking at art: "Don't touch." Children climb on them, languid young women recline, muscled men try to chin and those looking for a photo op — and there are many — don't simply pose or point but lean, crawl in or embrace. (These are certainly not behaviors one sees at the Henry Moore "Reclining Figure" in the North Plaza or Elie Nadelman's colossal figures in the New York State Theater — and probably not only because the former is surrounded by water and the latter are high on pedestals.) On a recent afternoon, children favored the yellow "snail"; adults the green "divan." Mr. West has spent his professional life relocating the aesthetic experience. The earliest physical pieces (his roots are in performance art) for which he became known were "passtücke" — "adaptives," made in the 1970's. These were roughly breadbox-size, amorphously shaped plasters of little glamour but idiosyncratic, funky appeal. People were meant to pick them up, carry them around, incorporate them into whatever activity they devised. In so doing, they completed the artwork by revealing something — awkward, funny, poignant or neurotic — about human behavior. As Robert Storr, a professor of modern art at New York University's Institute of Fine Arts and the curator of the current Site Santa Fe Biennial (whose theme is "Our Grotesque"), in which Mr. West is represented, has written, "It is people's ridiculous attempts at accommodating themselves to a world of uncanny things that forces them to acknowledge their psychological as well as physical alienation from given reality." ("I love the color, it looks like mustard," said Danny from Brooklyn, who was wearing a yellow rucksack that matched "Meeting Point 3." He added a scatalogical pun, not knowing he was intuitively sensing Mr. West's wicked play on the "plop in the plaza," the designation critics have given to the problem of unsuccessful public art.) At least that was the intention. Today, he says of the passtücke that "actually very few people did pick them up at the time." Mr. West, who looks a little like a cross between Albert Einstein and Walter Cronkite, says everything with a straight face, but his restless blue eyes often seem to be winking. A much-repeated story about him provides a helpful insight. In 1968, at the end of the most brutal, most transgressive, most body-fluid-filled, invective-spewing performance by artists associated with the brazen Viennese Actionist movement, Mr. West, a 16-year-old student in the stunned audience, stood up. "Thank you very much," he said. "I enjoyed your performance enormously." Then, addressing the assembly, he continued, "I think these gentlemen have earned a round of applause," thereby moving an ideological attempt at an authentic primal experience into the self-conscious realm of scripted theater. Any shyness on the part of those who picked up the passtücke did not dissuade him from continuing to make art to satisfy himself: endearing, odd upholstered furniture; mysteriously shaped, peculiarly painted plaster and papier-mâché boulders; and individual monumental pieces that he showed — or better, offered — in dozens of international biennials, museums, two Kassel Documentas and other sites, including Edinburgh's very proper Royal Botanic Garden for the 2001 Edinburgh Festival. "What I would demand, expect, like in art was touch," Mr. West said. "You would go into a museum or a gallery, and it could be so boring, simply a place for contemplation of the art. I am making what I want for myself, a gift to myself. I would like to go to sculpture that I can touch, that I can sit under. It has also to do with hapticality — the physical properties against my body and my face, and also my knee, some materiality. And yes, I like to see what other people do with it." He would never do an installation like this in Vienna. "There are too many expectations," he said. "They know me, I know them." Displaced to New York, the work (manufactured in Austria) has a sense of "unreality" for him — a crucial ingredient. As a child in postwar Vienna, Mr. West lived in a spare International style building, and he felt something was missing. It was "too rational, like the living of insects, or beasts," he said. It made him long for what was missing. "Art is the best solution for this missing piece," he said. "Art makes the difference between man and animals. Not simply to eat food and to reproduce. Man is an animal with illusion, and for me art is the illusion." This is the first time that Lincoln Center, which is juggling the demands of its constituents and the public in its ambition to redevelop and make its campus more inviting, has included the visual arts in its summer programming. (The sculptures remain on view through August.) It is clearly a crowd-pleasing addition, judging by the way theatergoers and participants in the Midsummer Night Swing events have encrusted the sculptures, ranging from the 20-foot-high "Dorit," which resembles a distressed Pepto-Bismol pink internal organ, on down. 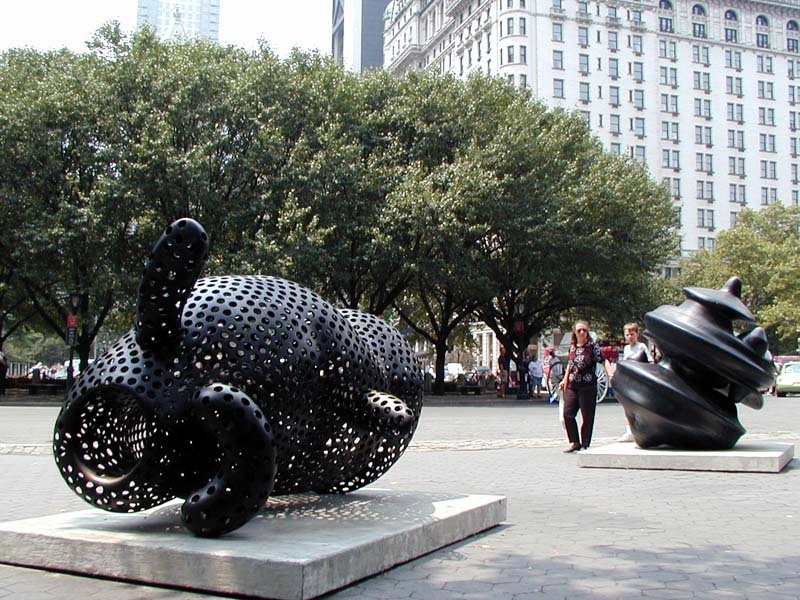 The installation was organized by the Public Art Fund and selected by its director, Tom Eccles, as was a complementary installation of two pieces at the Doris C. Freedman Plaza on the southern end of Central Park at Fifth Avenue. There, the lipstick-red and taxi-yellow "Mercury" sculpture-benches make the transient colors around Grand Army Plaza pop in a revelatory way. Jennifer Prediger, in New York from Washington and in a vacation mood, said she was thinking ketchup and mustard. "The aluminum gives me the urge to squash it like a beer can," she said. Back at Lincoln Center, shortly before curtain time, Johnathan Pirsos, 6, and his brother Milton, 5, from Manhasset, on Long Island, were sliding on what Johnathan called a "giant blue duckbill" — "Couch" — where they made a new friend, Abby, 7, from the Upper West Side. Abby liked the way her toenail polish matched the sculpture. Her mother, Dale, whose brother was in the band playing in the plaza that evening, thought it was great that the installation "brought the kids together." "It's like a Rorschach test," she said. "You see different things. That blue one" — "Ypsilon" — "reminds me of a shark with its head in the sand." The boys' father, Milton, was initially anxious. "I thought we were defacing art," he said. "I was going to tell them to get off." Like Goldilocks, Sara Campbell from Brooklyn tried other pieces before deciding that the flat surface of "Laube" was just right to settle down with a book. "I've already had several people take my picture and others ask me to photograph them," she said. She felt certain that "if someone was kicking people off, it would have happened by now." And Mr. West, watching the activity, was glowing. "I can't imagine this installation being in a better site," he said. "It's really a place of culture." And in the setting sun, who could tell if Mr. West was winking? Amy Newman is the author of "Challenging Art: Artforum 1962-1974." 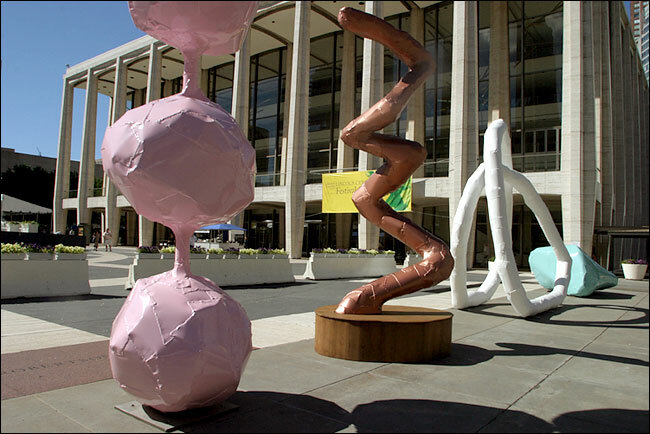 An installation of sculptures by the artist Franz West at Lincoln Center. Who would have thought it would be the Viennese avant-gardist Franz West who would produce the most lovable works of this year's outdoor sculpture season? Mr. West, who was born in 1947 and is much appreciated by progressively minded critics and curators in the United States and Europe, is known for making intentionally ugly art and mock furniture. Seen in the sleek upscale spaces of Gagosian Gallery in Chelsea last year, his big, gnarly abstractions made of roughly welded-together patches of aluminum and painted in retro colors like avocado and bubble-gum pink looked like the sort of thing that would particularly incense people who dislike modern art. With their lumpy, severely dented surfaces, they looked as though they'd been rolled around in a giant clothes dryer or attacked by sledgehammer-wielding philistines. They seemed less like real artworks than joke sculptures for the cognoscenti. Seeing similar works in outdoor displays organized by the Public Art Fund at Lincoln Center and at Doris C. Freedman Plaza, the busy southeast corner of Central Park, the impression is completely different. Far from being snide or elitist they are comical, friendly and intriguing, like a kindergartener's hugely enlarged papier-mâché creations. Seven of these works placed in a row at the top of the steps leading into the Lincoln Center plaza, with the tallest piece in the middle and the others in descending order to either side, constitute a zany visitors' welcoming committee. The tallest, a 20-foot-high pink column of four balls on a vertical pole, suggests the tail of an overgroomed poodle or a topiary bush. The others include a y-shaped, turquoise-colored piece like a simple tree with a single low, stumpy branch to sit on; a wobbly, copper-colored corkscrew shape, ironically titled "Bronze," which rises from a semirustic pedestal of unfinished wood; two tubular pieces in the form of big double loops colored refrigerator white and olive green respectively; an aqua-colored volume that looks like a partly squashed space capsule; and another tubular piece in bright yellow that's like a giant banana bent into a loop in the middle. The two sculptures at Doris C. Freedman Plaza look like weird inflatable boats, each about 20 feet long, and are colored respectively exactly like your local diner's ketchup and mustard squeeze bottles. The red one has pointed ends like a kayak and three pointed, upright cones projecting from its top surface. The yellow one has blunt ends and bulbous projections vaguely like air funnels on a ship. To viewers coming upon them on a hot summer day when there's a lull in the pedestrian traffic, Mr. West's sculptures may seem forlorn, pathetic and perhaps deservedly neglected by the general public. Hang around for a while and you discover something remarkable: it seems people really like them. Children, drawn to them like squirrels to trees, love to climb on them and grown-ups are grateful to sit on their lumpy but surprisingly comfortable surfaces. Passers-by laugh at them and make disparaging comments but good-naturedly. You don't see the expressions of suspicion, annoyance or boredom that you do on the faces of viewers of more serious works. Unlike outdoor monuments designed to remind us of noble moral or aesthetic ideals to which few of us can ever hope to measure up, Mr. West's works embody the ordinary imperfections of everyday life. They are antiheroic and anti-idealist, but not programmatically so. Neither are they abject or pathetic; they don't wallow in negativity. Ungainly and absurd as they are, they seem to happily accept themselves and whatever comes into their space. They are viscerally sensuous, but as vaguely representational constructions they are also mysterious; you wonder what they mean. All this makes them irresistible. The audience responsiveness is not just incidental. Mr. West is one of many producers of public art who have wanted people to interact physically with their works. (George Sugarman, Mark di Suvero and Scott Burton are three others who come to mind.) After his student years in Vienna during the heyday of Viennese Actionism, the mid-60's movement that had artists doing extremist, often dangerous and illegal public performances meant to aggressively provoke bourgeois observers, Mr. West wanted to orchestrate more agreeable relations between artworks and viewers. He made sculptures that he called "adaptives" — rough plaster objects that he meant for viewers to pick up and do something improvisational with. He also began producing rudimentary furniture of welded rebar — concrete reinforcing bar — and cheap fabric upholstery that he meant for people to actually use. So the sculptures on view now are logical extensions of what Mr. West has been doing for a long time. The difference is that whereas the social interactivity in his work has been as much theoretical as actual, with these new outdoor sculptures, theory gives way almost entirely to practice. What he has achieved is something rare: a genuinely popular populist avant-gardism. The Freedom of Expression National Monument was on exhibit at Foley Square in Lower Manhattan for three months. Two weeks ago, as small children clambered up a giant bronze sculpture in Harlem, Parks Department workers were gingerly erecting a 70-year-old limestone statue, fresh out of storage after 14 years, in Pelham Bay Park in the Bronx. The week before, Julian Opie, a British artist who rarely has shows in New York, installed a large exhibit of sculptures in and around City Hall Park, including two full-size three-dimensional steel cars "parked" on lower Broadway. And in February, 23 miles of pedestrian paths in Central Park will be draped with saffron-colored cloth, the first major public work by the artist Christo and his wife, Jeanne-Claude, in New York City. Public art is popping up around New York in numbers not seen since the early 1980's, when the city began requiring that one percent of the budget for certain city construction projects be spent on artwork. In the three years since Mayor Michael R. Bloomberg took office, the number of temporary public art installations around the city has more than doubled, to 49 pieces by 38 different artists, the greatest number in two decades, and more are on the way. "It is palpable now after a 10-year hiatus that there is an administration in City Hall that really recognizes art as part of a great civilization," said Susan K. Freedman, the president of the Public Art Fund, the largest installer of public art in the city. In some cases, places that have not featured art in years, like City Hall Park, are dotted with works again. Other spots where public art has never graced the scene, like Court Square Park in Queens, Tremont Park in the Bronx and the lawn of Gracie Mansion, have been the sites of installations. The surge in public art, said artists, those who work with them, and some government officials, is fueled by City Hall, where Deputy Mayor Patricia E. Harris, with Mr. Bloomberg's support, is quietly trying to make artwork a major part of the cityscape. Ms. Harris, who ran the city's Art Commission during the Koch administration, has pressed city agencies to work closely together to make sure that artists are given access to and help with installing temporary and permanent art shows. And she has turned to the private sector to help pay for installing works. "There is a long-term effort to try and involve artists in how the city will look in the future," Ms. Harris said. Wednesday, at the reopening of the Museum of Modern of Art, Mr. Bloomberg credited Ms. Harris with the his administration's interest in the arts. "Since we sit about two feet away from each other," he said, "even if I wanted to walk away from the arts I couldn't." Artists, buoyed by the resurgence, are increasingly looking to get their pieces installed in parks and other venues around the city, said Adrian Benepe, the city's parks commissioner, who oversees most of the installations. "Without soliciting artists," Mr. Benepe said, "we are getting more inquiries from artists and the galleries that represent them." Particularly inspiring was the installation of 22 large bronze sculptures by Tom Otterness along Broadway from Columbus Circle to 168th street, Mr. Benepe said. The Madison Square Park Conservancy, which maintains the refurbished park, blighted not so long ago, has begun to feature the work of sculptors like Mark di Suvero, who is known for his large works in steel. "Facing the public outdoors at no cost is very appealing to artists," said Stewart Desmond, a spokesman for the conservancy. "They become part of the landscape of the city, seen by tourists, people hurrying to work and kids in playgrounds. It is a very egalitarian gallery." The rise of art in public spaces is an extension of Mr. Bloomberg's attempt to make City Hall friendly to the art world, which became alienated under the administration of Rudolph W. Giuliani after numerous public battles, most memorably when the city set up a "decency commission" to evaluate art that benefited from public funds after the dispute over the "Sensation" exhibit at the Brooklyn Museum of Art. Mr. Giuliani and his subordinates were frequently critical of the Art Commission, whose task is to approve aspects of many city projects, and while City Hall was generous with capital money for the city's cultural organizations, it did not drive a citywide art agenda, said Ms. Freedman and several others. The Bloomberg administration has taken the opposite course, involving City Hall in aesthetic matters both small and significant. In renovating City Hall, a landmark building, it borrowed nine paintings and three sculptures from the Whitney Museum of American Art and borrowed other works for the lawn of Gracie Mansion and the Tweed Courthouse, which houses the Department of Education. The Percent for Art program - in which capital projects must include an artistic component - has been revitalized, and the Department of Cultural Affairs is producing a book featuring 20 years of its works. One of the latest examples of the program is an interactive work, aboard three new boats in the Staten Island ferry, that features a portal on the bridge decks with videos of the ocean floor and recorded sounds of the sea. Mr. Bloomberg has also revived mayoral arts awards, which he personally gives out, and he oversees private dinners at New York cultural institutions - events aimed at attracting donors and new board members. Under Ms. Harris's direction, renderings of New York Yankees' trophies on the city's phone directories - the Green Books - were replaced by reproductions of contemporary art. All city commissioners have been told to work closely with the art commission on public works projects. "This City Hall is rather interested in and concerned about the design and look of infrastructure projects," said Iris Weinshall, the transportation commissioner, who cited Ms. Harris's personal interest in projects like monitoring the design of 22 new pedestrian bridges over the Belt Parkway. Before he was elected, Mr. Bloomberg served on the boards of three cultural institutions in New York, including the Central Park Conservancy, which for 25 years had rejected the proposal by Christo Jeanne-Claude to drape Central Park in fabric. Mr. Bloomberg, who was always enamored with the project, made an effort to revive it. "When the mayor first came to City Hall, we agreed that I would explore it," Ms. Harris said. She persuaded the board, and Mr. Benepe, to reconsider the project once the artists scaled down their vision and assured them that no wildlife or trees would be harmed. The project will be the first public exhibition in New York for the two, who once wrapped the Reichstag, in Berlin, in white cloth and scattered several thousand blue and yellow umbrellas across Japan and California. Mr. Bloomberg is convinced that this work will draw tourists from around the world, some of them public art buffs who traipse to works like turtle watchers to the Galápagos Islands. Artists are not always aware of the administration's hand in getting projects together, but they like the result. "We really are going through a renaissance right now in public art," said Mr. Otterness, whose project lining Broadway had to wind its way through three community boards, the Parks Department and the Department of Transportation, all with City Hall quietly working behind him. (His work can also be seen in the 14th Street subway station on the Eighth Avenue line.) "And I can just see the results. A lot of the mechanics are sort of opaque to me, but I just know I was protected from up above." Chinatsu Ban. VWX Yellow Elephant Underwear/HIJ Kiddy Elephant Underwear, 2005. Fiber-reinforced plastic, steel, acrylic paint, urethane. A project of Public Art Fund and the Japan Society. Public Art Fund presents a series of four public art projects as part of Little Boy, a major exhibition hosted by Japan Society Gallery. The exhibition and public installations, all curated by Takashi Murakami, explore the astoundingly popular phenomenon called otaku, a Japanese youth subculture obsessed with fantastic and apocalyptic science fiction, fantasy, video games, comic books (manga) and film animation (anime), whose visual and musical forms are rapidly becoming globalized. Since she first began making art in 1997, Chinatsu Ban has developed a singular aesthetic style, creating acrylic paintings and sketches of elephants and human figures that float on a blank rice-paper background or in front of candy-colored stripes. V W X Yellow Elephant Underwear/H I J Kiddy Elephant, Ban’s first foray into sculpture, formally resembles her many colorful elephant drawings. With wide eyes, large bodies with small appendages, and no mouth, Ban’s pair of elephants are irresistibly cartoon-cute. But, for the artist, they are also charged with intense meaning and personal symbolism. Like Louise Bourgeois, in whose work spiders frequently appear as a totem of maternal protection, Chinatsu Ban’s elephants have a talismanic relationship to her own childhood. This dates back to a small elephant figurine she once bought, which became a charm and a reassuring symbol of peace and safety. Cuteness is an obsession for Ban, and her depictions are tinged with psychological edge. The Japanese word for “cute” is “kawaii.” More than just an adjective, the word has taken on tremendous cultural resonance in recent decades; the Japanese teen magazine CREA once noted that kawaii is “the most widely used, widely loved, habitual word in modern living Japanese.” From Hello Kitty, who first appeared on stationary products in the early 1970s, to more recent phenomena like pop duo Puffy AmiYumi, Japanese contemporary culture and the consumer goods market are saturated by all things kawaii. Anything can be made cute, even, in this case, a pile of elephant poop. Chinatsu Ban was born in Aichi Prefecture, Japan, in 1973. She completed her degree in Oil Painting at Tama Art University in 1995. She has had solo exhibitions at Marianne Boesky Gallery, New York (2005), Tomio Koyama Gallery, Tokyo (2003) and Canolfan, Nagoya (1998). Her work has also been shown at LAFORET Harajuku, Tokyo (2003), NADiff, Tokyo (2002), and the Museum of Contemporary Art Tokyo (2001). Ban currently lives and works in Japan. Doris C. Freedman Plaza is located at Fifth Avenue and 60th Street. Nearest subway: N, R to Fifth Avenue or 4, 5, 6 to 59th Street. Edward, can you give an update on other locations for viewing outdoor pieces? I'll be in town on the 20th-22nd. Is the typewriter eraser still on public disply? Last edited by AmeriKenArtist; May 9th, 2005 at 12:26 PM.